South Portland is the second biggest city on Maine’s Casco Bay. Because of your support and the work of some very dedicated community leaders, it’s now also the first city in the country to restrict toxic pesticides on municipal land and private lawns. The South Portland Pesticide Use Ordinance, which passed this past fall, is unique in the United States. So is Protect South Portland, the community group that won this victory. 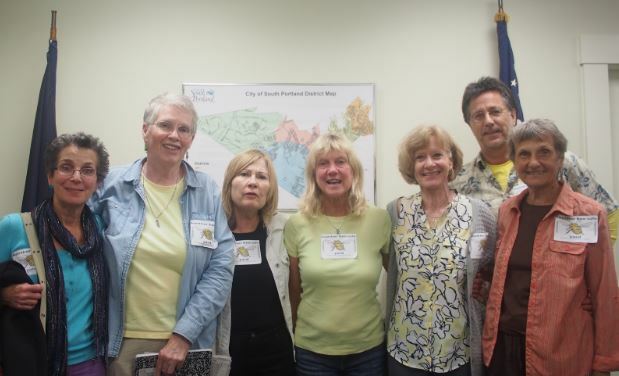 You might remember group members from Protect South Portland originally came together to fight a dangerous plan to transport Canadian tar sands oil through Vermont and New Hampshire and into South Portland to be loaded onto tanker vessels in Casco Bay. After defeating that plan by Exxon, Protect South Portland’s founder, Rachel Burger, began noticing other environmental hazards. The group’s campaign to curb pesticides in their community was born when Rachel became concerned about young city employees applying herbicides on city sidewalks without any protective equipment. Pesticides are chemicals that are designed to kill, and they harm more than just their intended pest. There has been a 700 percent increase in the non-agricultural use of pesticides in Maine over the past 20 years. More and more, humans are being exposed to toxic chemicals that have been linked to serious health problems such as Parkinson’s and cancer. It means that Casco Bay is seeing increased levels of chemicals that harm ocean life. And it means that native pollinators and honey bees are exposed to deadly insecticides. Despite these dangers, at City Council meetings about the ordinance in South Portland, chemical industry lobbyists used every justification they could think of to advocate for business as usual. Rachel and the other members of Protect South Portland were tireless in calling out and rejecting industry’s false claims, and in educating decision-makers and other residents about the risks that lawn and garden chemicals pose to the ecosystem and community of Casco Bay. Throughout this fight, we helped Protect South Portland connect with national pesticide and organic lawn care experts, and we worked side by side with the group to pack the room for local public hearings. We were so proud to celebrate with Protect South Portland as their neighbors and friends began to rally around the ordinance, and to continue celebrating as their community embraced organic lawn care. You’ve helped Rachel and Protect South Portland win two major local environmental fights. Given her successes, when Rachel says “I very much believe that it’s the grassroots that’s going to make a difference,” it really means a lot—and all of us at Toxics Action Center wholeheartedly agree. The victory you made possible in South Portland has inspired other towns across Maine to take action. Thank you for making all of this possible.